One reader noted a particular day's front page, which had all local stories, and said it "called my attention to the essential role which your newspaper has played historically in keeping us informed in a way no other public medium can match." Another was grateful for a story we broke about the state Department of Environmental Conservation citing the operators of the Cayuga Regional Digester for violations, saying "this is a good example of the critical role that journalism plays in our community." The final letter was a simple appreciation for the work of our staff photographer, Kevin Rivoli: "He captures the moment and the feeling of being there. He has a gift." You can visit auburnpub.com/opinion/letters to see all three letters in their entirety. Obviously, these letters made us feel good about the work we do and the value readers place on it. But I bring these letters up for this column not to glow in the warmth of some lovely compliments, but to point out what it took to provide the coverage that these readers noticed. To produce an all-local front page, to uncover a big environmental news development, to produce compelling photojournalism takes considerable time and care. It takes the work of journalists on the ground who conducted interviews, gathered documents, traveled to meetings and work sites, shot photos, wrote articles and captions, edited articles and photos, and arranged their placements in the paper, on the website and on our social media platforms. All of that work takes many hours of paid time and, in some case, requires equipment that our company has to purchase. In other words, it takes money. And our loyal readers have provided the financial support to make it happen. As our industry has evolved, readers have been consuming news in increasingly varied ways. Some still crave that hard-copy print edition delivered to their home or business. Some want to read it on their home computer, their tablet or phone. Some want to have the look and organization of a printed newspaper page in a digital format. Some want combinations of all of these. The good news is that The Citizen has options for readers that they can choose based on what works best for them. And in a couple of weeks, those options are going to become even more flexible and include some great perks. The Citizen and all of the newspapers in its parent company, Lee Enterprises, are rolling out a membership-based system for subscribers called News+ that will give readers a range of options. There will be different levels of perks and features with each option, and prices will be ranged accordingly. The beauty of this system is that it allows for people to support local journalism in the way that works best for them. Some will want the premium package with all of its benefits — from daily home delivery (which always includes digital access no matter what membership level) to discounts on classified ads and access to newspaper websites around the country. Others may want just digital access for as little as $3 per month to get started. No matter what you decide works best for you, though, understand that your subscription is supporting local journalism. Without this support, we can't operate. That's why every journalist who works here wants to make sure that support is rewarded each day with news and information about your community, state, nation and world that matters to you and your family. 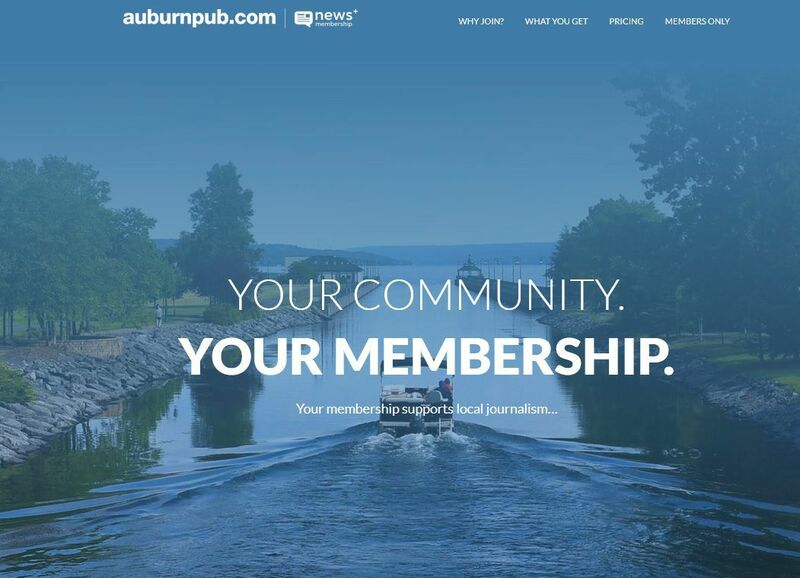 A great place to see more about our news membership plans and the kind of journalism that they support can be found on our website at auburnpub.com/members. It's a site that showcases some of the work that has truly resonated with our readers, and it will be updated regularly as the News+ membership program rolls out and evolves.